This is the Tenax Polyester Hardener for Tenax Polyester resins. The Polyester resin you purchase does come with hardener, but since the mix ratio is 3% hardener to resin some of our cusomers request extra hardener, because mixing that type of ratio is an inexat science. 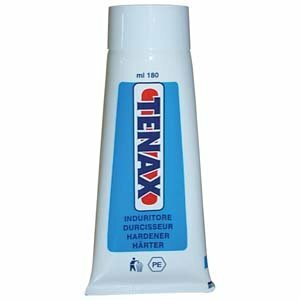 This 180-ml tube will harden 4 - 5 liters of polyester resin.This is only the Tenax Polyester Hardener - Polyester resin is NOT included! This is a HazMat (hazardous material). It can only be shipped via UPS Ground Delivery to the continental USA or UPS Standard Delivery to Canada. It is not able to be shipped via any other level of service or outside of the continental USA and Canada. Ships to CONTINENTAL U.S.A. and Canada only-- it is not available for delivery to Alaska or Hawaii. Shurtape PC-628/BLU360 P-628 Industrial Grade Gaffers Tape: 3" x 55 yd.